Both Volkswagen Group brands share values such as “dynamism, passion for design and commitment to innovation and technology,” according to Seat Sport head of strategy, business development and operations, Antonino Labate. The Spanish brand points out that like Ducati, it has a successful track record in racing. Since 1970, Seat has won two World Touring Car Championships (2008 and 2009), more than 25 rally titles, and has successfully organised several single-brand competitions worldwide. 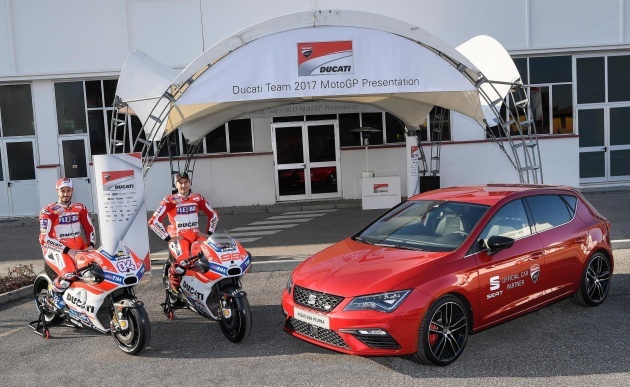 The official Ducati team car – the recently facelifted Seat Leon Cupra 300 – is the most powerful in the history of the Barcelona-based brand. Unveiled in December, the hot hatch has 300 PS, 380 Nm and AWD, which makes it good for a 0-100 km/h time of just 4.9 seconds. The car will appear at the MotoGP opening race in Qatar in March, and will reach dealers in the same month. VW owns Seat. and VW owns Ducati too. Leon is an all new model. what better way to promote this car. genius.